Climate risks to German foreign trade were examined for the first time in an UBA research project. Germany is a major player in international trade. It makes our economy vulnerable to the impact of climate change in other regions of the world. The German Environment Agency (UBA) has completed a first-ever study of the climate risks for international trade relations. The study claims that the risks of climate change occurring abroad affect Germany's economy to at least the same extent as it does foreign economies. UBA's President Maria Krautzberger said: "We now know what to expect in Germany because of climate change. This includes droughts and heat waves as well as extreme weather events. Climate change and its consequences know no national borders. Its impact in other regions around the world can wreak serious economic havoc on us, for example when extreme weather events damage infrastructure, impair agricultural production or even destroy an entire harvest." 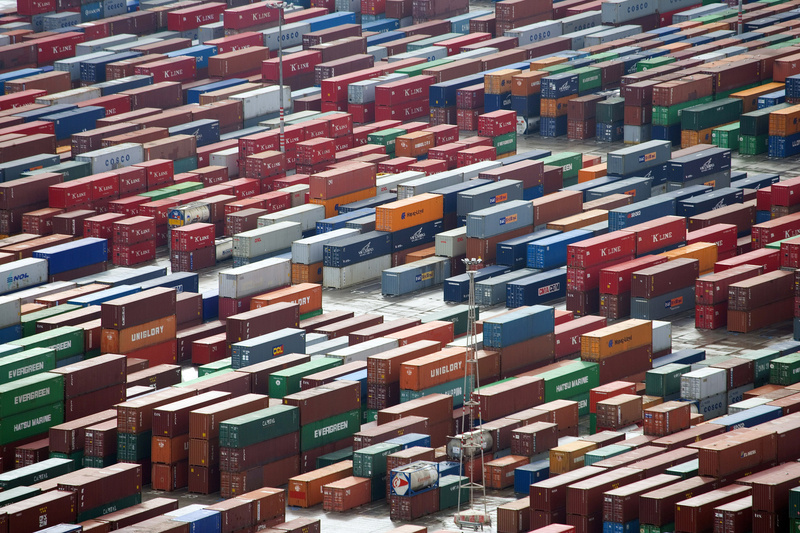 German companies have an annual import-export volume with a market value of one trillion euros. The report illustrates which share of the country’s trade might possibly be affected by the consequences of climate change abroad. Six per cent (55 billion euros) of Germany’s imports and four per cent (roughly 50 billion euros) of its exports are tied to twelve countries or regions which are considered particularly vulnerable to climate change. Extreme weather events can damage buildings, production facilities and warehouses abroad. Persistent warm spells, intense rainfall events or heavy storms can severely impair agricultural production, possibly destroy entire harvests. Harbour and port facilities worldwide will have to grapple with more frequent extreme weather events and rising sea levels. 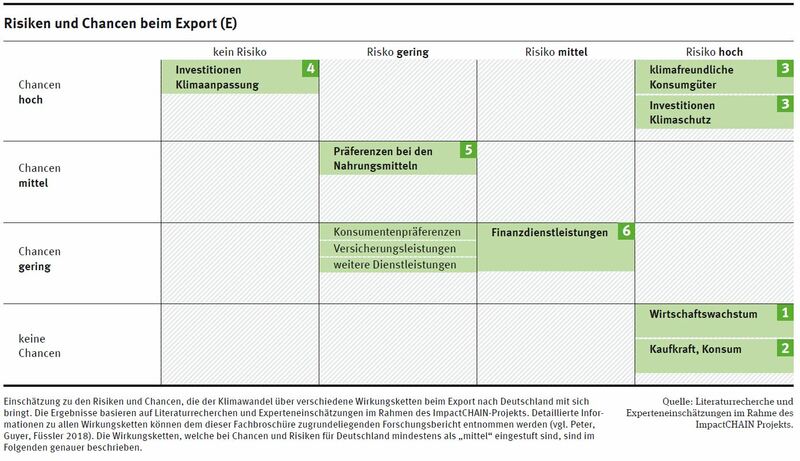 The picture on the export side is more mixed: when countries spend more money on repairing damage, buying power is weakened and thus also the demand for German export products. However, there are also chances associated with the growing global demand for goods and services related to climate adaptation and climate change mitigation. To take advantage of these chances German companies must be pro-active and adopt ambitious climate policies. Decision makers in industry and public administration should be made aware of the risks of climate change worldwide. Maria Krautzberger said: “When investments are made, for example in infrastructure, it must be a matter of course to calculate climate change risks and build accordingly.” Banks and insurance companies are increasingly examining these aspects. 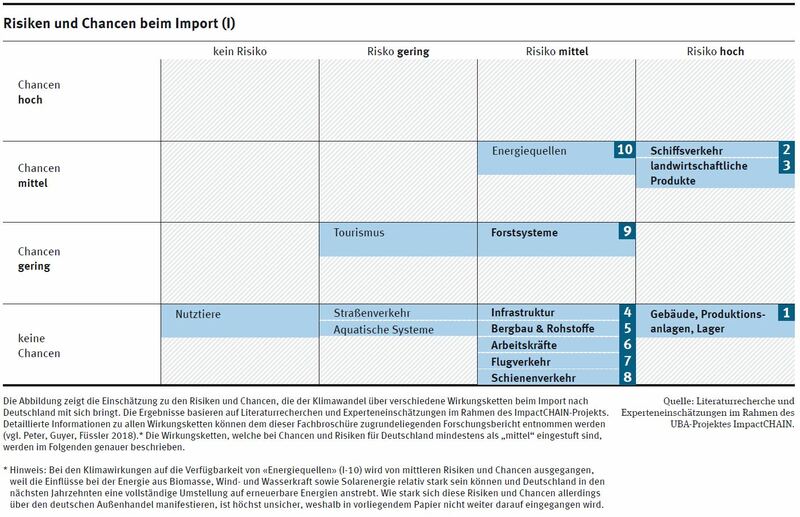 The brochure entitled Wie der Klimawandel den deutschen Außenhandel trifft [How climate change will affect German foreign trade] details the chances and risks which climate change harbours for the German economy. The brochure (German language) is a product of UBA’s Impact-CHAIN project which runs until 2020 and was commissioned to INFRAS. The project team will now examine how the German economy can handle these risks and use the potential chances, how great the need for action is, and what areas require either private or public sector measures. The German Strategy for Adaptation to Climate Change creates the framework for adapting to the impacts of climate change in Germany. The Strategy, headed by the Federal Ministry for Environment, establishes a medium-term process which defines appropriate objectives and develops and implements potential adaptation measures. These measures include strengthening resilience to the effects of climate change abroad.